This is an interactive programme to understand historical and cultural knowledge around a Great Artist with slide presentations,discussions and interpretations around the style and works of that Artist. The participants get to explore techniques inspired by the Artist. The interactive sessions will help them evaluate the effectiveness of their choices to further refine their work. Furthermore,they explore their own visual ideas with use of different materials and techniques in new ways. Each participant creates their individual expressive artwork based on the learnings. 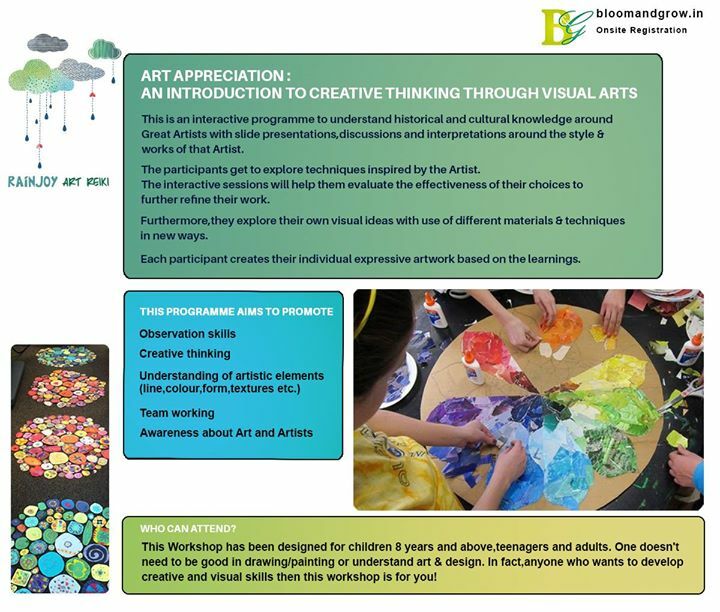 To develop creative design thinking through engagement with Visual Arts. Understanding Work and Styles of various Artists. Inventing own visual ideas to experiment based on inspirations and discussions. Appreciating tactile qualities of different materials. Use of materials and techniques in new ways. Forming decisions,refining work and evaluating effectiveness of individual choices by adapting elements of various artists’ works. Recognition and description of artistic styles of Great Painters. Exploring the artists’ styles into own individual expessions. Translating the inspirations into artworks with different techniques and materials. This Workshop has been designed for children 8 years and above,teenagers and adults.One doesn’t need to be good in drawing/painting or understand art & design. In fact,anyone who wants to develop creative and visual skills then this workshop is for you! Participants can attend all 3 modules or join per week per module as well. Rainy KS is a textile designer with over eighteen years of experience in design and development of home textiles for the international market. She is an alumnus of NID,Ahmedabad and currently working as an independent practitioner for Indian exporters. She has been associated with private and government organizations,craftspeople and industrial units in areas of printing,weaving and surface ornamentations. Her areas of interest are study of trend forecasts, material explorations, fabric manipulations & surface ornamentation techniques.She is passionate about the heritage crafts of our country.She is particularly interested in sharing knowledge with students and skill enhancement trainings for livelihood generation programmes.She has forayed into teaching creative programmes after moving to Bangalore recently.Her craft modules at Christ University and Bloom & Grow have been well received by her students. All the art materials will be provided. Book now to reserve a place by registering on the website – bloomandgrow.in.